Fixed operations can be the most profitable area of a business, but too often it is simply treated as an afterthought. Search Optics has created solutions that boost your brand’s greatest source of recurring revenue. We’ve reinvented the phone book for the digital world and the mobile Internet. With 85% of your customers using local search before they even begin shopping, it is critical to monitor the growing number of online directories for outdated and false information. Using a mix of technology and manual processes, our team of professionals continually claim, audit, and update over fifty listings with updated and relevant content. Search Optics ensures your business will get noticed, reviewed, and located, thus generating your fixed ops business twenty percent more leads and phone calls on average. 50+ directories covered – We cover well over half of the local search world with listings including Google+, Yelp, and Yahoo. Monthly offers – Search Optics posts small text-based offers to your directories and actively pushes phone calls to your locations. Sales matching – We are the only provider who can match your local search campaigns to actual car registrations. Reputation management – We monitor and notify you of reputation management issues at no additional cost. Create personalised, revenue-generating content for customers at every life cycle touch point. 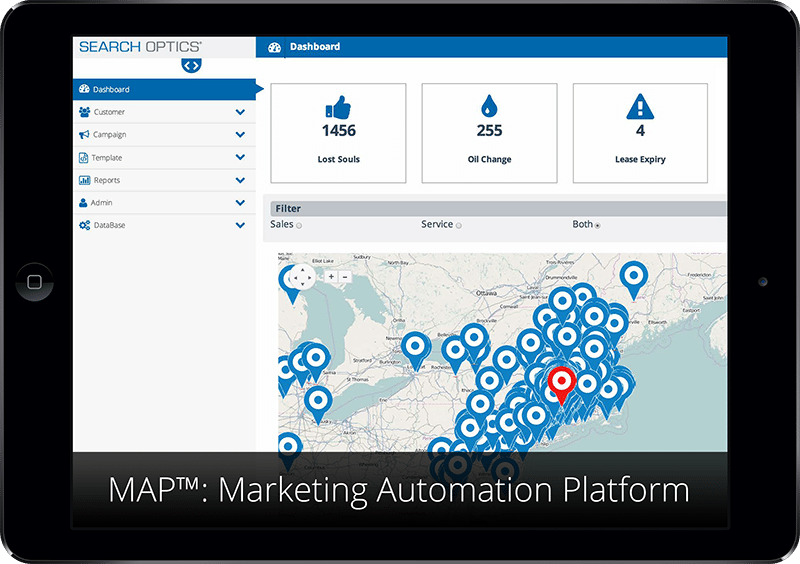 MAP, or Marketing Automation Platform, generates recurring revenue from and maximises the lifetime value of your customers by integrating every life cycle touch point into a single unified, behavior-driven solution that designs and delivers personalised and relevant content developed to increase repurchases, referrals, and retention for sales, service, and fixed operations departments. MAP works automatically, but it is fully customisable to the specific needs of your business and includes many unique components. Follow-up and recovery – We ensure your customers stay on course after the initial point of sale with triggered communications. Loyalty and reward programs – MAP promotes customer loyalty and boosts retention rates with post-purchase opportunities. Service appointments – We maintain a consistent flow of communication with current customers with customised service campaigns. In-store solutions – These include service schedulers, appointment ledgers, technician dashboards, and inspection tools. Personalised URLs (PURLs) – Our technology creates PURLs that serve up customised content for every visitor to your website. Marketing intelligence – We shine a light on your business behind the balance sheet by tracking and reporting on a range of metrics. Your operations may be fixed, but your revenue doesn't have to stop growing. We can show you the way.